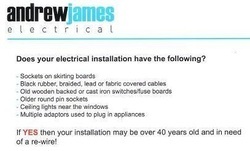 Andrew James offers an electrical service in both domestic and commercial installations throughout the Essex and London areas. With our experience we can offer a full domestic and commercial electrical service at competitive rates. From additional sockets and lights, to fault-finding and full rewires, no job is too small.